The amount of beer drank in the last year increased but the consumption of cider, spirits and wine all fell. 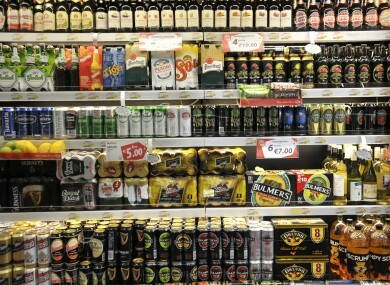 IN THE LAST year, the amount of alcohol consumed in Ireland fell by 4.4 per cent. While in the past 12 years, it declined by 20 per cent. The amount of beer drank in the last year increased by 1.4 per cent, while cider fell by 13.6 per cent, spirits declined by 13.4 per cent and wine was down by 6.6 per cent. “Consumption of alcohol in Ireland has been declining for over a decade; the idea that all Irish people drink to excess is simply not the case. The majority of people in this country consume alcohol in a moderate, responsible manner that is entirely compatible with a healthy lifestyle and in line with European norms,” said Kathryn D’Arcy, director of Alcohol Beverage Federation of Ireland. She added that the figures were particularly relevant in the context of the Alcohol Bill that proposes to ban alcohol companies sponsoring sporting events. The reality is that restricting advertising and sponsorship delivers good sound-bytes but will not have a long-term impact on actualising cultural change,” said D’Arcy. The figures were revealed in a paper by Anthony Foley of Dublin City University Business School in which he compares the Revenue Commissioners’ alcohol clearances data for Q1 of this year with the figures for the same time in 2012. Email “'Drunken Irish' no more: Alcohol consumption falls 20% in 12 years”. Feedback on “'Drunken Irish' no more: Alcohol consumption falls 20% in 12 years”.